Passages to the Past: New Jean Plaidy re-issue in 2010! Another Jean Plaidy re-issue! Woo Hoo!!! SYNOPSIS: Born leader and brilliant soldier, William of Orange thought the English court a hotbed of vice and conspiracy -- Charles II with his mistresses, the Dukes of Monmouth and York ambitious for the throne. 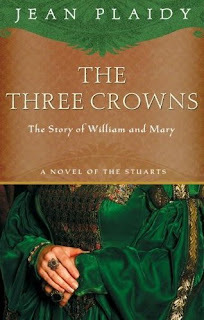 William wanted no reluctant bride, but the three crowns of England, Scotland and Ireland were worth a little sacrifice. He would marry the fifteen-year-old Mary, bring her back to Holland, and teach her who was master. All England rejoiced. Only Mary wept. She knew married people were rarely happy. That's a pretty cover - I especially like the green. I discovered Jean Plaidy several years ago and I still love to read her books, some I've read more than once. I do enjoy endulging in Jean Plaidy's historic ficiton novels. Thanks for letting us all know about this one. I have not read it, but figure I would love it. I just started reading Jean Plaidy thanks to the "Historical Fiction Roundtable" bloggers. I'll be checking in my local Barnes and Noble for this one. Thx so much! this sounds fantastic! great cover. No, you're not allowed to post this!!! lol Thanks Amy, I hadn't realized they released the cover! Sounds like something to look forward to! I love Jean Plaidy (Victoria Holt). I will have to check my keeper boxes to see if I have this one.